The new Eastwood Mall has been opened since December but I had not really taken the time to check it out. 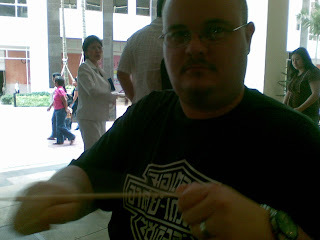 I don't like "malling." For some reason, I felt "adventurous" today so I asked Jerry if he wanted to go there for lunch and maybe go around a little bit. First stop was Mr. Kurosawa, which Ren said had really good food - plus, I hadn't had Japanese food in a while so the craving was starting to kick in. Now get ready for some of the most mouthwatering Japanese dishes I have ever had! 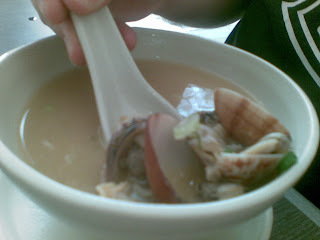 For the appetizer, we ordered bowls of miso soup with clams. Unfortunately, they only had one serving left so we had to share, which was a pity because the soup was so good! I have had miso with fish but never with clams. I like the latter better. For PHP108, it was very much worth it! Next up - Beef Teppan and Seafood Teppan Platter. We always order this dish (or whatever is the closest to it) when we eat Japanese. The cut of the beef was different - it came in chunks, as opposed to the strips that we are used to. But let me tell you, I had the most tender chunks of beef for lunch! 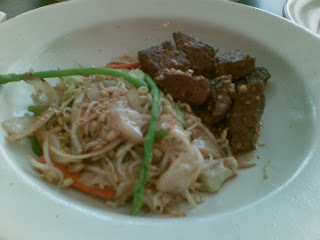 As you can see, the serving was not very big BUT the flavor and texture of the meat made up for that. PHP358 might be a bit steep, though. If the serving size for the beef seemed small, this seafood platter was more than enough! 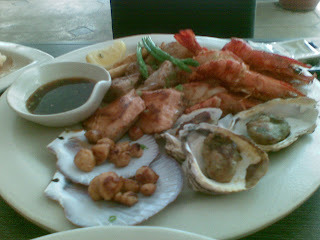 I think that there were 5 or 6 prawns in there, 3 oysters (which made my tongue get thick, by the way), lots of tiny scallops, and chunks of tuna, dory, and salmon. We didn't finish the whole thing! This one goes for PHP548. 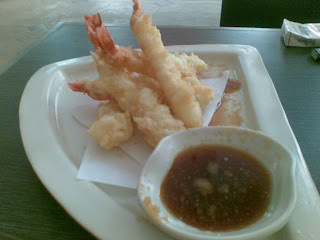 Another dish that we always order is the Ebi Tempura. It was nothing special, but just as good as any other tempura that I've had. PHP368 for 5 pieces. Needless to say, we were both stuffed to the brim after that meal. I even had to take home a doggie bag - I only managed to down 2 of the sushi rolls. Oh, and Jerry had some Japanese fried rice, which didn't really impress. He also had some blue tea (I thought it looked gross). 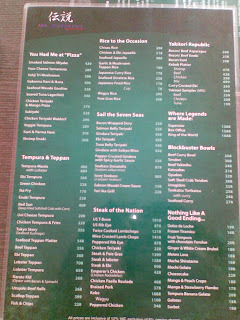 If you want to take a look at the menu, just click on the pictures below. They're not very clear - I forgot Garcia (again!) and had to make do with Kvothe's mediocre camera. Looks pretty good and I haven't even had breakfast yet! The Japanese places around here are the "cook everything in front of you" style of hibachi cooking which we really like. Have to go to Kansas City for the closest decent sushi. Isn't the world great? NONE of the food you show or mention would be anything I would like or even want to try! But thank goodness for diversity! That is what makes life so fun! D-the food was very very good. And yeah, my husband keeps looking for one of them habachis here but we haven't really had much success. Hey, did you get the info for the job? Retired-now you got me interested in what makes you hungry! Oh Mr. Kurosawa, at last we meet. 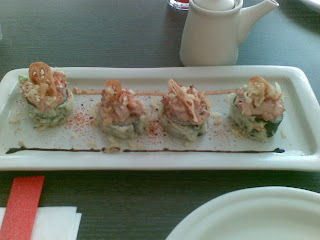 :-) I love Japanese food! 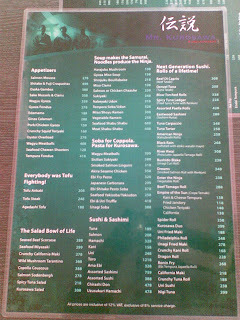 I think I want to try that place ...when I have money again. Hahahaha! Nikki - let's go there one weekend. Vicki - let's go, too! How have you been? ooohhh! try the monte carlo sushi! that's our favorite!